Last Friday 20th June, was the anniversary of the first day of Queen Victoria’s reign, although she was actually crowned a year later. I wrote a post about The Birth of the Victorian Era for this occassion. When I saw that the subject of the Flash Friday Challenge on 20th June was a cartoon including Queen Victoria, I decided to take part. In case you don’t know about this challenge there’s a prompt and a word limit of 140 – 160 words. This was the prompt for last weeks’ challenge: The picture below, and the royal command to include the concept of arrogance. 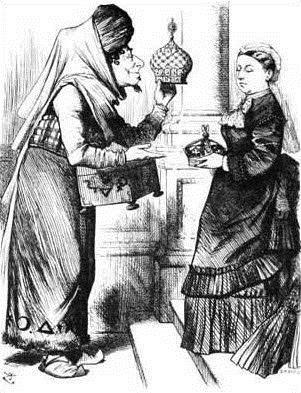 “New crowns for old ones!” –Benjamin Disraeli presents Queen Victoria the crown of India. Punch, 1876, by cartoonist John Tenniel. ‘I would give my crowns, my jewels, my castles, and the whole of India in exchange for Albert! Can you give me that?’ She screamed. Loved the humour in this and of course the cartoon!